Even with photography trends that focus on bright colorful images with deeply saturated colors, I feel there is still a great need for powerful B&W photography. Sometimes B&W can be used as a crutch when the light is flat or you do not have a range of bright colors. I like to use B&W when you have powerful, moody skies. Those dark moody clouds can communicate a lot of emotion and give you the opportunity to tell a story that is less ordinary than what you normally see. Taken with the new Nikon Z 7 with the Nikkor Z 24-70 f/4 S lens. I cranked up the clarity and structure in the monochrome settings in camera to capture the shadow detail. 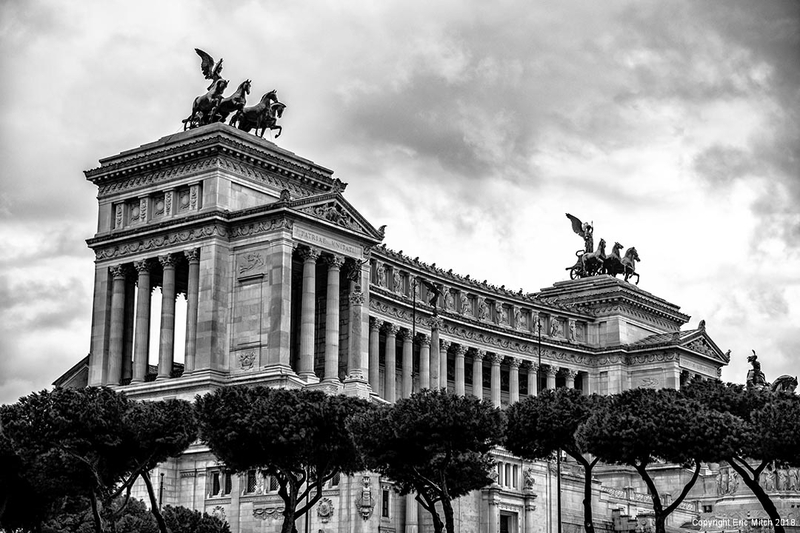 In this instance at the Altar della Patria (Altar of the Fatherland), I’m try to bond with my Italian roots, the light was behind some pretty awesome moody clouds. Most of the images you see of the monument are in front of blue skies or lit up at night. I took advantage of this unique, grey overcast rainy day and turned it in to something different than what you normally see splashed all over Instagram. This entry was posted in Thoughts, Travel, What I've learned.